Windows Startup Manager. WinTools.net - software tools for MS Windows. Many programs "consider" themselves the most important programs in a system: they place themselves in startup and in a System Tray of a system. This leads to unreasonable using of system resources, of random access memory; and finally, to reducing processor power. 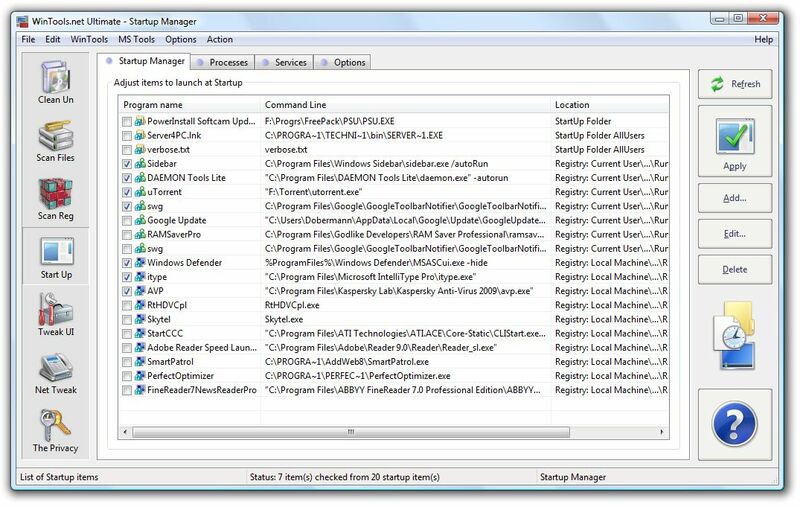 As a rule, such programs write information about themselves not in the Start section of the "Startup" menu, but in the Windows registry without leaving the option to the user and complicating the process of checking the autothread process. The "Startup" tool monitors all records about autothread and allows to delete/add and temporarily disable records. After temporary disabling the records you need to apply changes by pressing the Apply button. For deleting, editing or adding records you can use "Delete", "Edit" and "Add" buttons accordingly. Using the "Options" bookmark you can indicate which places the "Startup" tool will check when looking for records about startup.